I feel guilty taking advice from members on my workshop build and not being able to give anything back. 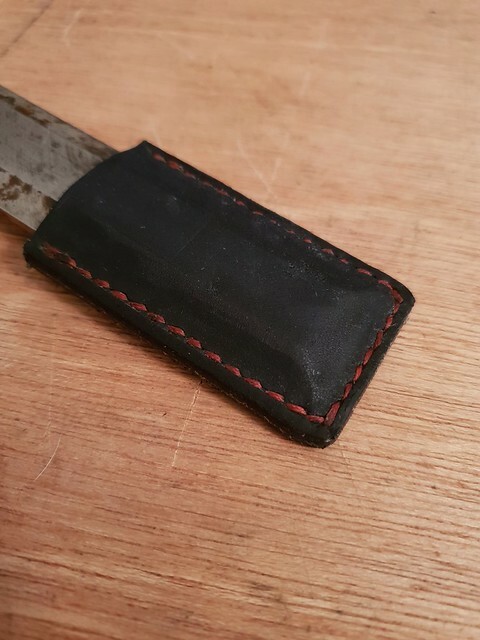 So I was wondering if anyone would be interested a quick tutorial in making a very simple chisel cover. I have made one previously but did not take any pictures. This is one of my old chisels it got damp in the garage my new Narex chisels are going to have either a box or tool roll. After taking the picture I decided it was too large so I have trimmed it. I set a pair of dividers to 3 mm marked my first line down one edge laid the chisel down and drew another line using my ruler and dividers I marked the outer line, and cut. Using the same setting on the dividers I walked them down the lines leaving a nice little mark where the stitching will go. I have diamond shaped tools called pricking irons or stitching chisels to mark the stitches but dividers work other items can be used even forks. I should say I am not looking to make these to sell to anyone I just thought it might be of interest. If you were to offer to make to order, I'm pretty certain there wouldn't be a shortage of customers. I think most of us like to see how things are made, even if we never end up making them. These are something that is very useful so there is a good chance some of us will get a round to it at some point in the future. So please show all the steps, details of the type of leather you are using and where to buy small amounts from would also be useful. I’d definitely be interested in a tutorial, and as Dave said recommendations on leather suppliers. 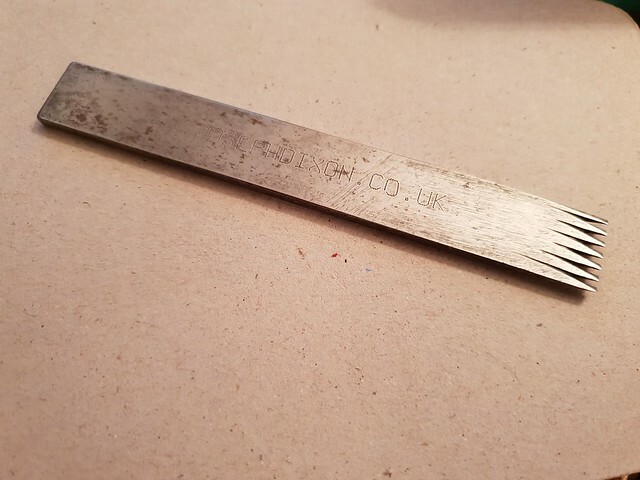 Love leather work and need a kick to get started ashamed to say one of my hook knives is still stored in the piece of cardboard it was posted in! Needs a cover. Malc2098 wrote: Looks nice, Michael. 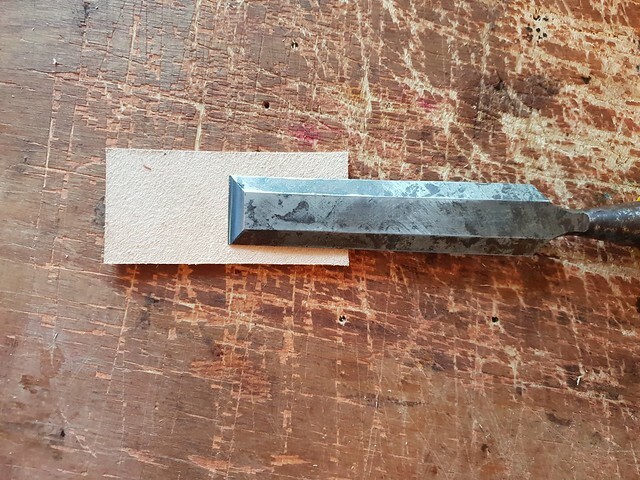 I have to be honest Malcolm I have no real idea how this is going to turn out even having the chisel here it is a bit of trial and error when I wet the leather it will stretch and form around the chisel. I will gladly help anyone who cannot or does not want to make their own but it really is not that difficult. I think the first few steps are straight forward but if anyone has any questions please ask. How do you stop the leather absorbing atmospheric moisture and actually accelerating rust? Maybe once shaped and dried, the leather can be soaked in something water resistant? Dubbin perhaps. 9fingers wrote: How do you stop the leather absorbing atmospheric moisture and actually accelerating rust? Yes indeed Bob the leather will need to be treated any type of wax will do I use neats foot oil or carnauba wax. After I marked the holes I used a small amount of glue to hold the two pieces together whilst I made the stitching holes. This is veg tanned leather the only type that will mould to a form when wet and will maintain the shape when dry. I use a solution of wire wool dissolved in white vinegar to turn this type of leather black, It also works for oak as I am sure you know. WARNING If you allow veg tanned leather into contact with metal it will discolour very quickly. This is the original you tube clip I was sent the leather part is around 2 mins in Mt Chickadee uses some sort of light wax looks like mink oil paste to me. Do you mean this type of thing? Plenty of others on a google search, or have I got the wring end of the sharp bladed thing?! What thickness of leather would you recommend for these? I had a quick look on Ebay and there are lots of different options to be had. 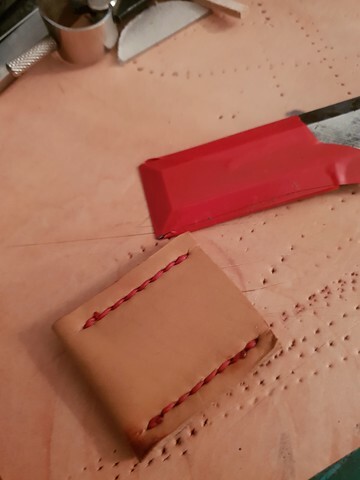 Also in the video he does not fold the leather but stitches on three sides, which way is best? I used 3 mm Mr Chickadee look to be using 5mm anything over 2mm would be good I am going to sort out a list if you can hang on until it rains and I can’t work outside. If you need to buy some don’t buy belly leather as it stretches as you might expect. I folded mine as I thought the chisel would cut through the stitches. I am going to restart the tutorial as this one is so tight I will have to cut it off the chisel I am thinking of 2 mm per side for clearance. My first plan was to use Keydex a Thermo plastic as a liner you heat it and mould it around a form or the object in the case of a chisel. 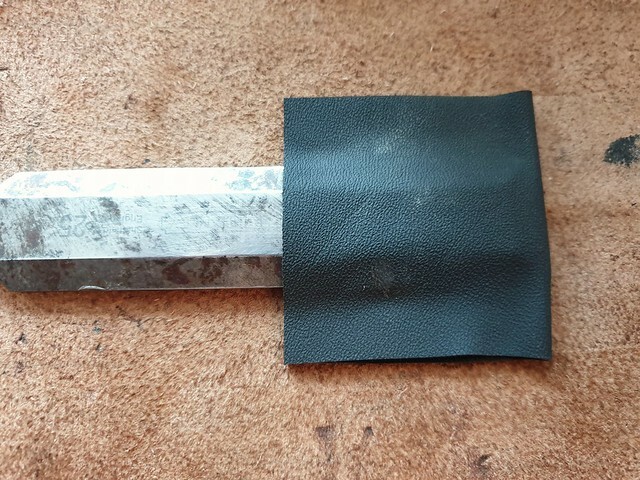 After moulding I wrap it in leather in the USA it is often used to protect blades. The thermoplastic liner sounds good as I'd be worried by an lined version and the stitches being cut by the chisel edges. Bob. Thinking about the Kydex liner I will make a sample and see what it looks like the other option would be to add a third piece of leather to act as a gusset keeping the sharp edge away from the stitches. Mike if you left the leather unfinished and it got wet it would change the colour of the metal and the leather would loose its shape. I dont think this is rust as such it is a chemical reaction with the tannins in the leather. This is what happens to tool steel when untreated leather gets it was never intended to get wet but I forgot to tell the dog that and he took it outside. This cover was the first one the colour of the leather was changed by dipping it in a solution of wire wool dissolved in white vinegar. Well, precisely, Michael, which is why I can't see the need for a lining inside the leather. Who is going to allow their chisels to get wet? BTW, my chisels (or the largest 3) all got stained a deep blue-black from working for months with green oak. It is so superficial that a quick wipe on the [enter sharpening system of your choice] removed it instantly and completely. I am sure I could remove the marks from my tools should I wish to remove the top surface but they are tools. 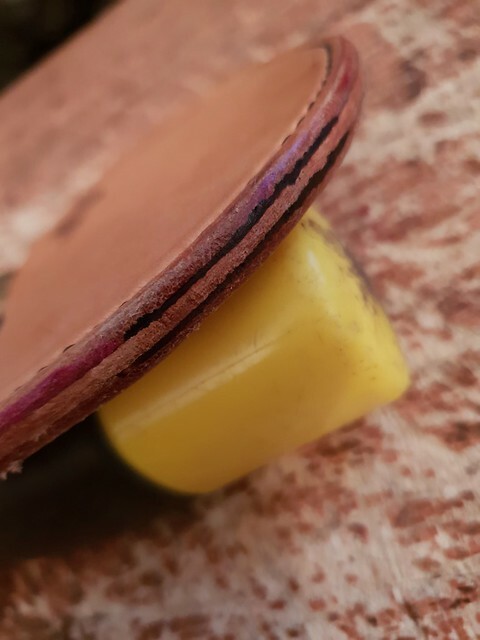 Here is a round knife and its cover I have highlighted the 3 pieces of leather with a felt pen this blade would cut through the thread easily hence the third piece of leather. I will make a cover with a Kydex liner and we will all be able to see if it works. It might be a few days while I catch up on cases. I think Kydex on its own would work very well although it would be much wider due to the need to rivet it. I am sorry that I started this thread then did not respond for some time I had to take advantage of the fine weather. to get my workshop out of the ground as they say. Woodster wrote: I think Kydex on its own would work very well although it would be much wider due to the need to rivet it. 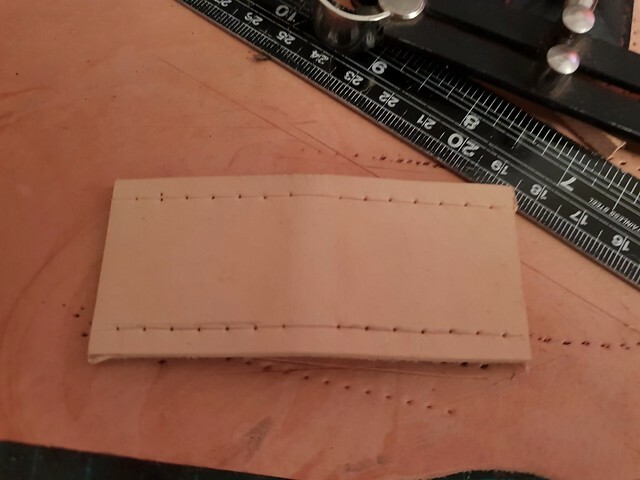 I dont rivet my kydex I usually weld it, ( in a well ventilated area) in this case I would be tempted to leave the edges open gluing it to the leather and allowing the leather to hold it in place. I really wish I could show you a fancy vacuum press that I use for forming the kydex, Unfortunately I dont have one (yet) I do have a piece of leather which I use for rolling or forming the heated kydex. 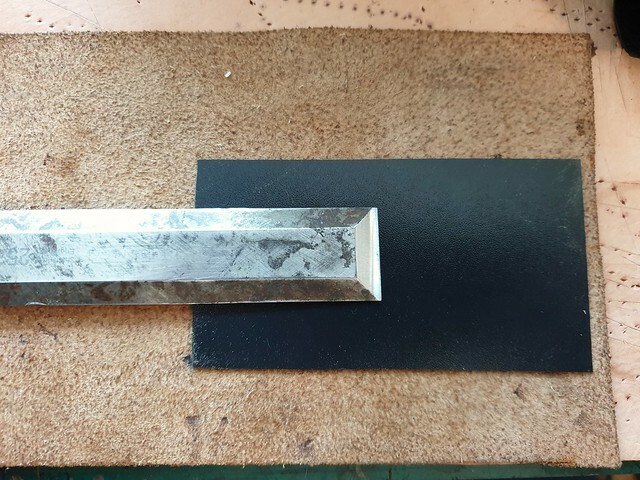 Kydex and the piece of leather for forming and the chisel. I know of some leatherworkers mainly in the USA who stitch with machines who just stitch throught the kydex and leather in one go.